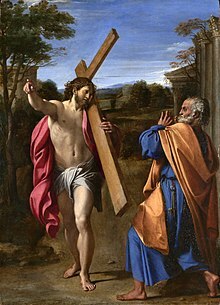 Annibale Carracci (Italian pronunciation: [anˈnibale karˈrattʃi]; November 3, 1560 – July 15, 1609) was an Italian painter and instructor, active in Bologna and later in Rome. Along with his brothers, Annibale was one of the progenitors, if not founders of a leading strand of the Baroque style, borrowing from styles from both north and south of their native city, and aspiring for a return to classical monumentality, but adding a more vital dynamism. Painters working under Annibale at the gallery of the Palazzo Farnese would be highly influential in Roman painting for decades. Annibale Carracci was born in Bologna, and in all likelihood was first apprenticed within his family. In 1582, Annibale, his brother Agostino and his cousin Ludovico Carracci opened a painters' studio, initially called by some the Academy of the Desiderosi (desirous of fame and learning) and subsequently the Incamminati (progressives; literally "of those opening a new way"). While the Carraccis laid emphasis on the typically Florentine linear draftsmanship, as exemplified by Raphael and Andrea del Sarto, their interest in the glimmering colours and mistier edges of objects derived from the Venetian painters, notably the works of Venetian oil painter Titian, which Annibale and Agostino studied during their travels around Italy in 1580–81 at the behest of the elder Caracci Lodovico. This eclecticism was to become the defining trait of the artists of the Baroque Emilian or Bolognese School. In many early Bolognese works by the Carraccis, it is difficult to distinguish the individual contributions made by each. For example, the frescoes on the story of Jason for Palazzo Fava in Bologna (c. 1583–84) are signed Carracci, which suggests that they all contributed. In 1585, Annibale completed an altarpiece of the Baptism of Christ for the church of Santi Gregorio e Siro in Bologna. In 1587, he painted the Assumption for the church of San Rocco in Reggio Emilia. In 1587–88, Annibale is known to have had travelled to Parma and then Venice, where he joined his brother Agostino. From 1589 to 1592, the three Carracci brothers completed the frescoes on the Founding of Rome for Palazzo Magnani in Bologna. By 1593, Annibale had completed an altarpiece, Virgin on the throne with St John and St Catherine, in collaboration with Lucio Massari. His Resurrection of Christ also dates from 1593. In 1592, he painted an Assumption for the Bonasoni chapel in San Francesco. During 1593–94, all three Carraccis were working on frescoes in Palazzo Sampieri in Bologna. Based on the prolific and masterful frescoes by the Carracci in Bologna, Annibale was recommended by the Duke of Parma, Ranuccio I Farnese, to his brother, the Cardinal Odoardo Farnese, who wished to decorate the piano nobile of the cavernous Roman Palazzo Farnese. In November–December 1595, Annibale and Agostino traveled to Rome to begin decorating the Camerino with stories of Hercules, appropriate since the room housed the famous Greco-Roman antique sculpture of the hypermuscular Farnese Hercules. Annibale meanwhile developed hundreds of preparatory sketches for the major work, wherein he led a team painting frescoes on the ceiling of the grand salon with the secular quadri riportati of The Loves of the Gods, or as the biographer Giovanni Bellori described it, Human Love governed by Celestial Love. Although the ceiling is riotously rich in illusionistic elements, the narratives are framed in the restrained classicism of High Renaissance decoration, drawing inspiration from, yet more immediate and intimate, than Michelangelo's Sistine Ceiling as well as Raphael's Vatican Logge and Villa Farnesina frescoes. His work would later inspire the untrammelled stream of Baroque illusionism and energy that would emerge in the grand frescoes of Cortona, Lanfranco, and in later decades Andrea Pozzo and Gaulli. Throughout the 17th and 18th centuries, the Farnese Ceiling was considered the unrivaled masterpiece of fresco painting for its age. They were not only seen as a pattern book of heroic figure design, but also as a model of technical procedure; Annibale's hundreds of preparatory drawings for the ceiling became a fundamental step in composing any ambitious history painting. The 17th-century critic Giovanni Bellori, in his survey entitled Idea, praised Carracci as the paragon of Italian painters, who had fostered a "renaissance" of the great tradition of Raphael and Michelangelo. On the other hand, while admitting Caravaggio's talents as a painter, Bellori deplored his over-naturalistic style, if not his turbulent morals and persona. He thus viewed the Caravaggisti styles with the same gloomy dismay. Painters were urged to depict the Platonic ideal of beauty, not Roman street-walkers. Yet Carracci and Caravaggio patrons and pupils did not all fall into irreconcilable camps. Contemporary patrons, such as Marquess Vincenzo Giustiniani, found both applied showed excellence in maniera and modeling. By the 21st century, observers had warmed to the rebel myth of Caravaggio, and often ignored the profound influence on art that Carracci had. Caravaggio almost never worked in fresco, regarded as the test of a great painter's mettle. On the other hand, Carracci's best works are in fresco. Thus the somber canvases of Caravaggio, with benighted backgrounds, are suited to the contemplative altars, and not to well-lit walls or ceilings such as this one in the Farnese. Wittkower was surprised that a Farnese cardinal surrounded himself with frescoes of libidinous themes, indicative of a "considerable relaxation of counter-reformatory morality". This thematic choice suggests Carracci may have been more rebellious relative to the often-solemn religious passion of Caravaggio's canvases. Wittkower states Carracci's "frescoes convey the impression of a tremendous joie de vivre, a new blossoming of vitality and of an energy long repressed". In the 21st century, most connoisseurs making the pilgrimage to the Cerasi Chapel in Santa Maria del Popolo would ignore Carracci's Assumption of the Virgin altarpiece (1600–1601) and focus on the flanking Caravaggio works. It is instructive to compare Carracci's Assumption with Caravaggio's Death of the Virgin. Among early contemporaries, Carracci was an innovator. He re-enlivened Michelangelo's visual fresco vocabulary, and posited a muscular and vivaciously brilliant pictorial landscape, which had been becoming progressively crippled into a Mannerist tangle. While Michelangelo could bend and contort the body into all the possible perspectives, Carracci in the Farnese frescoes had shown how it could dance. The "ceiling"-frontiers, the wide expanses of walls to be frescoed would, for the next decades, be thronged by the monumental brilliance of the Carracci followers, and not Caravaggio's followers. In the century following his death, to a lesser extent than Bernini and Cortona, Carracci and baroque art in general came under criticism from neoclassic critics such as Winckelmann and even later from the prudish John Ruskin, as well as admirers of Caravaggio. Carracci in part was spared opprobrium because he was seen as an emulator of the highly admired Raphael, and in the Farnese frescoes, attentive to the proper themes such as those of antique mythology. On July 8, 1595, Annibale completed the painting of San Rocco distributing alms, now in Dresden Gemäldegalerie. Other significant late works painted by Carracci in Rome include Domine, Quo Vadis? (c. 1602), which reveals a striking economy in figure composition and a force and precision of gesture that influenced on Poussin and through him, the language of gesture in painting. Carracci was remarkably eclectic in thematic, painting landscapes, genre scenes, and portraits, including a series of autoportraits across the ages. He was one of the first Italian painters to paint a canvas wherein landscape took priority over figures, such as his masterful The Flight into Egypt; this is a genre in which he was followed by Domenichino (his favorite pupil) and Claude Lorrain. Carracci's art also had a less formal side that comes out in his caricatures (he is generally credited with inventing the form) and in his early genre paintings, which are remarkable for their lively observation and free handling and his painting of The Beaneater. He is described by biographers as inattentive to dress, obsessed with work: his self-portraits vary in his depiction. It is not clear how much work Annibale completed after finishing the major gallery in the Palazzo Farnese. In 1606, Annibale signs a Madonna of the bowl. However, in a letter from April 1606, Cardinal Odoardo Farnese bemoans that a "heavy melancholic humor" prevented Annibale from painting for him. Throughout 1607, Annibale is unable to complete a commission for the Duke of Modena of a Nativity. There is a note from 1608, where in Annibale stipulates to a pupil that he will spend at least two hours a day in his studio. There is little documentation from the man or time to explain why his brush was stilled. Speculation abounds. In 1609, Annibale died and was buried, according to his wish, near Raphael in the Pantheon of Rome. It is a measure of his achievement that artists as diverse as Bernini, Poussin, and Rubens praised his work. Many of his assistants or pupils in projects at the Palazzo Farnese and Herrera Chapel would become among the pre-eminent artists of the next decades, including Domenichino, Francesco Albani, Giovanni Lanfranco, Domenico Viola, Guido Reni, Sisto Badalocchio, and others. River Landscape (c. 1599)—Oil on canvas, National Gallery of Art, Washington, D.C.
San Rocco Giving Alms to the Poor (1595)-Oil on canvas, Gemäldegalerie, Dresden. The tradition of Italian Renaissance painting and the mature Renaissance artists like Raphael, Michelangelo, Correggio, Titian and Veronese are all painters who had a considerable influence on the work of the Carracci, in his use of colours. Carrci laid the foundations for the birth of Baroque painting. The preceding sterile Mannerist style had its recovery now in the Baroque painting in the early sixteenth century, succeeding in an original synthesis of the many schools. The paintings of Annibale are inspired by the Venetian pictorial taste and especially the paintings of Paolo Veronese. The work that show traces of it are the Madonna Enthroned with Saint Matthew, a work made for Reggio Emilia and now in the Gemäldegalerie, Dresden, and the Mystic Marriage of Saint Catherine of Alexandria (ca. 1575), now preserved at the Gallerie dell'Accademia in Venice. ^ "Annibale Carracci, Images – NGA". nga.gov. ^ "Annibale Carracci". www.metmuseum.org. Retrieved 1 October 2014. ^ "carracci/annibale". www.wga.hu. Retrieved 1 October 2014. Wittkower, Rudolph (1993). "Art and Architecture Italy, 1600–1750". Pelican History of Art. 1980. Penguin Books. pp. 57–71. Gianfranco, Malafarina (1976). "preface by Patrick J. Cooney". L' opera completa di Annibale Carracci,. Rizzoli Editore, Milano. H. Keazor: "Distruggere la maniera? ": die Carracci-Postille, Freiburg im Breisgau, 2002. C. Dempsey: Annibale Carracci and the beginnings of baroque style, Harvard, 1977; 2nd ed. Fiesole, 2000. A. W. A. Boschloo: Annibale Carracci in Bologna: visible reality in art after the Council of Trent, 's-Gravenhage, 1974. C. Goldstein: Visual fact over verbal fiction: a study of the Carracci and the criticism, theory, and practice of art in Renaissance and baroque Italy, Cambridge, 1988. D. Posner: Annibale Carracci: a study in the reform of Italian painting around 1590, 2 vol., New York, 1971. S. Ginzburg: Annibale Carracci a Roma: gli affreschi di Palazzo Farnese, Rome, 2000. C. Loisel: Inventaire général des dessins italiens, vol. 7: Ludovico, Agostino, Annibale Carracci (Musée du Louvre: Cabinet des Dessins), Paris, 2004. B. Bohn: Ludovico Carracci and the art of drawing, London, 2004. Annibale Carracci, catalogo della mostra a cura di D. Benati, E. Riccomini, Bologna-Roma, 2006–2007. M. C. Terzaghi: Caravaggio, Annibale Carracci, Guido Reni tra le ricevute del Banco Herrera & Costa, Roma, 2007. H. Keazor: "Il vero modo". Die Malereireform der Carracci, (Neue Frankfurter Forschungen zur Kunst 5), Berlin: Gebrüder Mann Verlag, 2007. C. Robertson: The Invention of Annibale Carracci (Studi della Bibliotheca Hertziana, 4), Milano, 2008. F. Gage: "Invention, Wit and Melancholy in the Art of Annibale Carracci." Intellectual History Review 24.3 (2014): 389–413. Special Issue, The Nature of Invention. Edited by Alexander Marr and Vera Keller. Wikimedia Commons has media related to Annibale Carracci.